Marudur Gopala Ramachandran (January 17, 1917�December 24, 1987), popularly known as MGR, Puracthi Nadigar, Ponmana Chemmal and Puratchi Thalaivar (tamil: Revolutionary Leader), was a long time Tamil film actor and Chief Minister of the Indian state of Tamil Nadu from 1977 until his death. He was born at Nawalapitiya near Kandy, Sri Lanka, to Maradhur Gopalamenon and Satyabhama. After his father's death, MGR settled with his family at Kumbakonam in Tamil Nadu. He could not pursue his studies beyond the primary stage due to poverty and hence joined a drama troupe. Gaining considerable experience on stage, he entered the world of cinema, and gradually rose to enviable positions by persistent efforts and endurance. He became an actor, with a huge mass appeal. He was also a very good director and producer, and was also known to be an expert movie editor. He was married to Janaki Ramachandran in 1949 and did not have any children. In 1987, MGR fell sick and was rushed to the U.S. for treatment. Mass hysteria gripped Tamil Nadu and over 100 people attempting self-immolation. 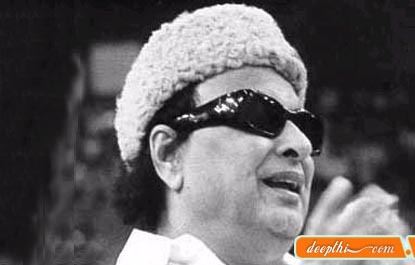 MGR died December 24, 1987 after his prolonged illness. Over two million persons followed his remains, around 31 followers committed suicide and thousands had their heads tonsured. He was posthumously awarded the "Bharat Ratna" by the Government of India. After his death, his political party, the All India Anna Dravida Munnetra Kazhagam, split between his wife Janaki Ramachandran and his long time companion and political protege, J. Jayalalitha. He willed all his property for the welfare of the poor and hearing impaired people of Tamil Nadu. Making his film debut in 1936, in the film Sati Leelavathi, MGR did not attain great popularity until his role in the 1947 film Rajakumari. He rose to stardom by playing characters that potrayed him as the saviour of the poor. His movies were the medium of communication for the Dravidian movement. For the next twenty-five years he remained one of the biggest celebrities in Tamil cinema. Movies like [[Madurai Veeran, a champion of the Tamil Dalits, helped gain the admiration of the dalits in the state. His star power did not diminish even after he was shot by fellow actor M.R.Radha, affecting his ability to speak clearly. Even then he undauntedly carried on only to give box-office hit after hits,later paving way for his entry into poiltics. He won the national award in the best actor category for the film Rickshakaran while his filmdom rival Shivaji Ganesan who was considered better actor than him didn't win it even once.